The University Enterprise Office organizes a three-day retreat to prepare its students for an ambitious program. Several group activities were organized to break the ice between the students. The students took part in workshops on fundraising and electoral campaign. 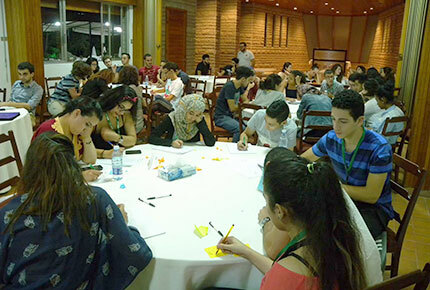 Last weekend, LAU-Middle East Partnership Initiative Tomorrow’s Leaders program (LAU-MEPI TL) held a three-day retreat in the mountains of Feytroun. The workshop and activities-filled event was primarily designed to break the ice between the newer students and those already studying at LAU, as well as to prepare them for the program’s intense demands. The dimensional shift expected of the students by Touma and the administration of the LAU-MEPI TL program is a very serious and ambitious one. The students will be taking part in three big initiatives while studying: My Passport My Visa (a drive to allow Arab citizens to travel freely between Arab countries), the Debates initiative (which trains the students on how to defend and communicate their ideas) and Donate to Educate (a campaign to educate refugees and the needy). The LAU-MEPI TL students will also be supporting an alumna and four female students as they run for parliament in their respective countries. For all those projects, they will require a very advanced set of real world skills. “This year the students will learn about accepting the other, be introduced to electoral campaigning and also learn about fundraising,” says Loulwa Kaloyeros, MEPI’s academic coordinator. “This is a scholarship program that is leadership based, and will potentially create leaders from ten different Arab countries. The scholars are highly engaged in social and political issues and many of them have already become top leaders in LAU’s MUN and debate programs, for example,” she adds.